New for July 2010! Thermal conductivity is an important material property in regards to packaging electronic components. A related property that you must consider is thermal expansion. Thermal conductivity is denoted by the lower case letter "k". The S.I Units of thermal conductivity are Watt/meter-degree K (W/M-K). Higher conductivity means heat is moved farther with less temperature rise (Generally a good thing). However, if you base a critical design on this simple calculation, failure is all but guaranteed! Thermal conductivity is often a strong function of temperature, this is true in gallium arsenide. Here's a short list of packaging materials, you can click on them to look up thermal conductivities (assumed at room temperature). If you are in need of exact data, please search elsewhere, we don't take any reponsibility for accuracy. 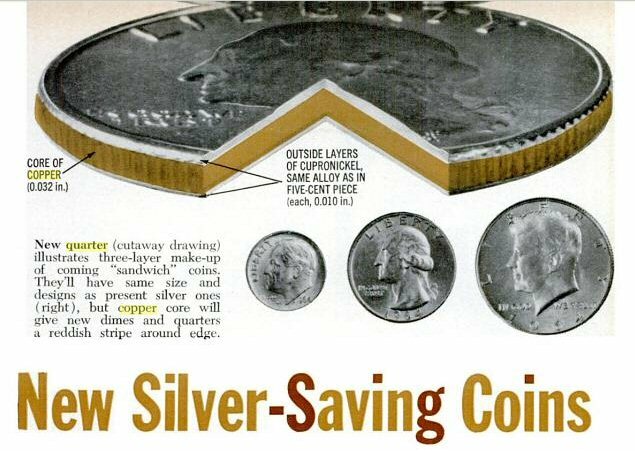 In the early 1960s the U.S. government was stamping out pure silver quarters, dimes and half-dollars, which were imminently about to be worth more than the fiat value. Once a coin is worth more than it costs at the local bank, they start to disappear, even though is is a federal offense to export coins or melt them. Drop the coin right into the slot, you've gotta hear something that's really hot! A September 1965 Popular Science article explains the solution, we borrowed the image below. The image serves as a good example of a coin metal sandwich. As far as the thermal conductivity of a quarter, this property was certainly degraded when the switch was made from pure silver. Alloys are notorious for being poor heat conductors. One way to tell a silver quarter from the modern version is to drop them and compare the tones, silver quarters ring like a bell!